I take every occasion to have a swim at river Limmat (perfectly situated in between office and home). And I am scared that these summer-days will soon come to an end as I really appreciate hanging out there. 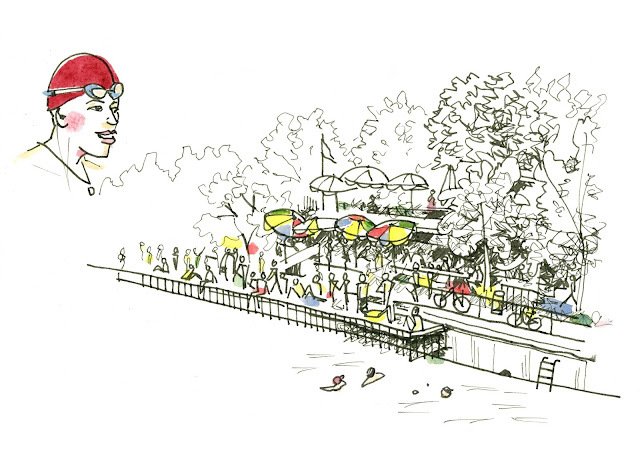 Today I sketched the Kiosk at Oberer Letten – a symbol for Zurich during summertime (look at these colorful umbrellas!) – to remember it until next season will start again. Ja, Andre, so gut inszeniert und mit rot, gelb und blau signalisiert, werden mir die Badi-tage gut in Erinnerung bleiben. Cool, nice to see you back. Sehr schön das Gewimmel von Menschen und Sonnenschirmen in den Primärfarben. Mehr Sommer geht kaum!